With its six white columns and sprawling wings on either side, Drumthwacket is among Princeton’s most visually striking buildings. But the official residence of the governor of New Jersey, last occupied from 2002 to 2004 by former Gov. James McGreevey and family, is in need of some major TLC. Since Gov. Phil Murphy took office last January, First Lady Tammy Murphy has made the Stockton Street property a priority. Working with the Drumthwacket Foundation, Mrs. Murphy plans to spruce up the building, inside and out. 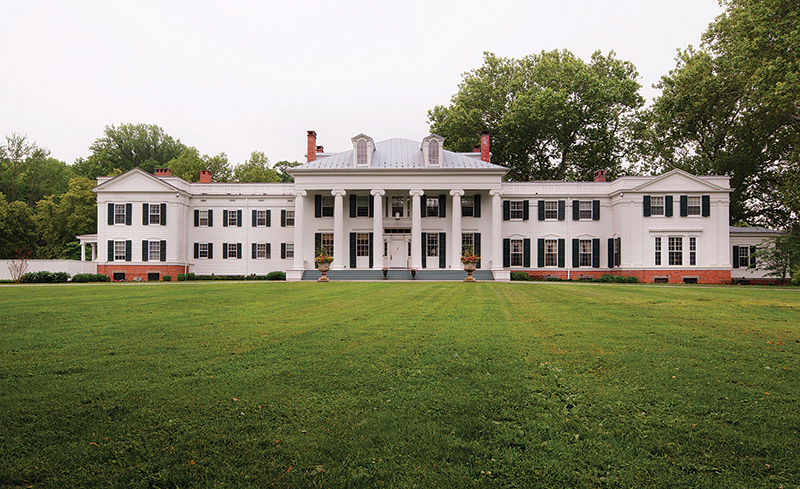 The house, which dates from 1835 and is listed on the National Register of Historic Places, is regularly used for receptions and open to the public on a limited basis. But the upstairs family quarters has decades-old carpeting, loose plaster moldings, and a few electric sockets that are falling down. This summer, students from Rutgers University’s horticulture department documented plantings and helped develop a master plan for stormwater management. “So the students get real, practical experience, and we don’t spend a lot of money,” Mrs. Murphy said. In the upstairs residential areas, carpeting that was installed in the 1980s was ripped out to reveal original flooring in a few places. “It’s beautiful and it needs to be restored,” Mrs. Murphy said. A capital campaign that is in the beginning stages will help support the project, which will be done through the nonprofit Drumthwacket Foundation. Mrs. Murphy said other foundations, corporations, and individuals will be approached.